Deborah Anapol was the one of the most inspiring tantra teachers we have had the privilege to meet, learn from, be trained by, and work with. We met her first at a Conscious Sexuality festival in the summer of 2011, fell in love with her work, took her 5-day Pelvic Heart Immersion workshop s in London, and became her assistants in the followingwing year. What she taught us that Autumn, and by the end of the course we were hooked. Her whole approach to working with mapping energy and through breathwork, embodiment, gestalt and intimate bodywork was inspirational. Pelvic Heart Integration was the name Jack Painter originally gave to a core section in his now famous system of bodywork, Postural Integration. In his later years Painter separated out this most intimate and therapeutically radical element in his work, and continued to develop it as stand-alone healing process. 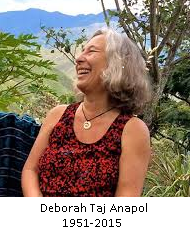 Deborah Taj Anapol was a key colleague of Painter’s at this time — a clinical psychologist, therapist, and tantra teacher, whose whole life and work celebrated human sexuality as a path to greater wholeness. Deborah worked with Jack Painter for over 10 years, and continued to teach Pelvic Heart Integration until her death in August 2015. It was our privilege to have Deborah as our teacher and dear friend for four years, and it was her wish that we should take up teaching and sharing this powerful tool for personal transformation. PHI is a offers a unique combination of tools for those who wish to move beyond their conditioning into greater authenticity around gender, sexuality and relationship. It opens the whole body to greater sexual flow, releasing energetic blockages, and connecting heart and pelvis. It also offers a unique way to access strength and support from the ancestral line, allowing access to full aliveness, unencumbered by the wounds of the past. That is why we include what Painter and Anapol pioneered by including PHI in our Celtic Tantra programme. Our workshops are based on the Activations‘ programme which Deborah Anapol developed for teaching us. Our most condensed version of this is based on what Deborah called a 5 or 6 day Immersion, and we currently call an Intensive. We are also developing what we are calling PHI for Couples. We have also been authorised by Deborah to offer Individual Sessions.